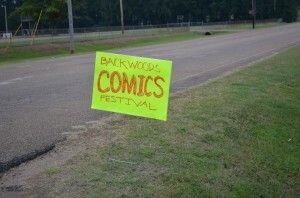 The Backwoods Comics Festival- Good Southern Fun! 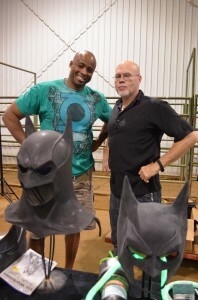 This past Saturday my wife Nicki and I got up early, hopped in the Batmobile, and headed down I-55 South towards Jackson, MS. The event was held in the Louisville Coliseum in Louisville, MS- which is northeast of Jackson, and just south of Starkville. We made good time on the way down and didn’t have any problems finding the place. 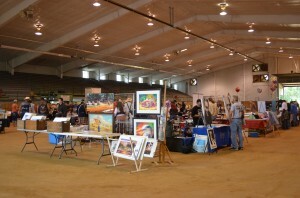 This was the first time I’d set up at a show that had a dirt floor- that wasn’t outside! 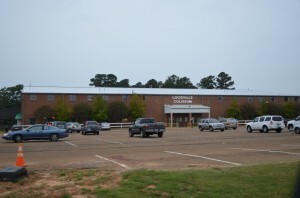 Apparently there are rodeos here when there isn’t a comic show. Luckily for us, the dirt was hard packed, the place didn’t smell like farm animals, and the big doors at either end were open for some good ventilation. It did get a bit muggy later in the afternoon, but the rain held off until the show was over- which could have made loading up a bit problematic, and messy. 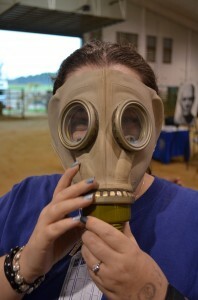 I must say this was one of the easier shows to set up at. 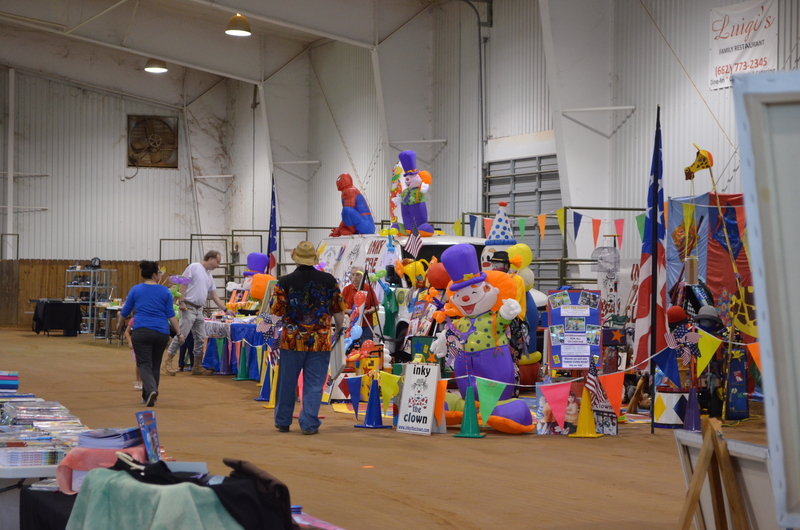 Some of the vendors were able to drive right inside to set up and tear down. We got there early so finding a good space up front was easy, and after loading in Nicki moved the car around to the side by the big door so we could load out easier. 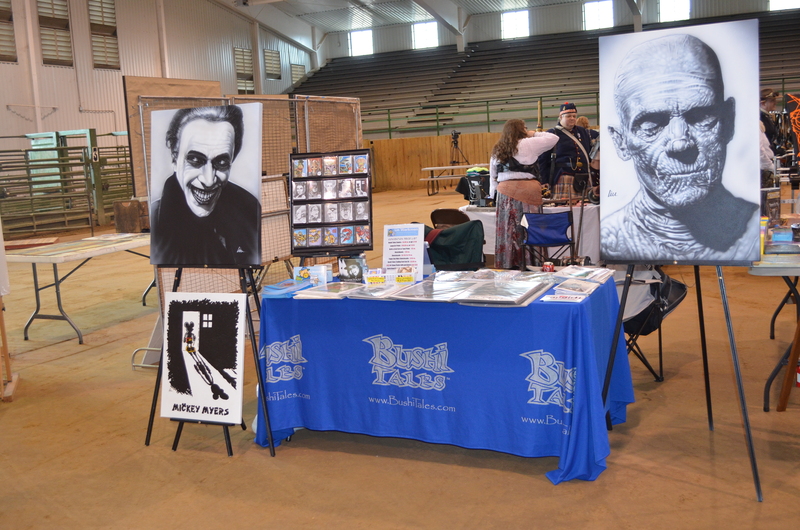 I need to re-do my table layout/set-up. 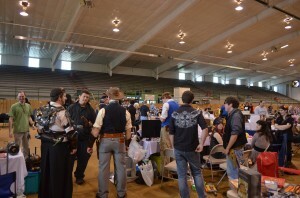 I was happy to have most of my merchandise and table cloth in one tote and a zipper portfolio this time. 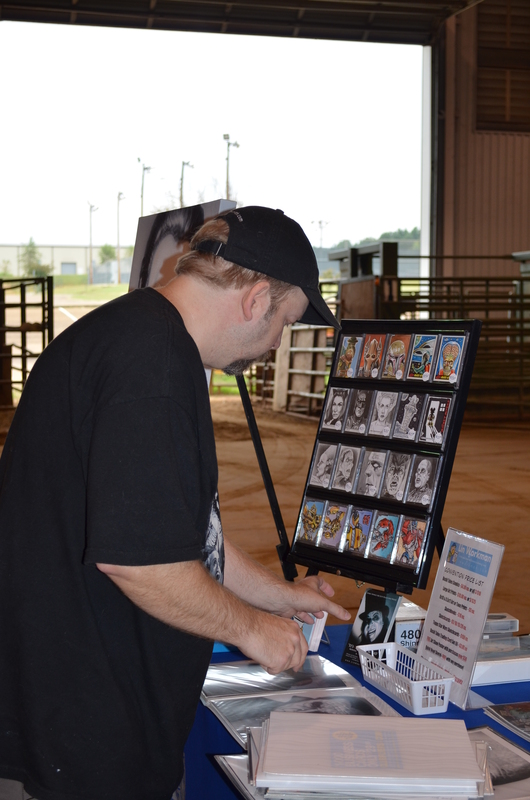 The paintings and sketchcards were the only things that weren’t. I normally don’t travel with the paintings but glad I did for this show. Since my Bushi Tales partner Dave has both BT banners they helped get people’s attention instead. 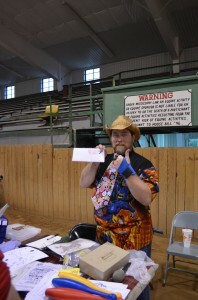 I’ll be ordering a new Have Geek Will Travel banner and some promo items, as well as making a new HGWT tablecloth, tees, hats, and a Geeker poser puppet for next year. Since this was a first year show I didn’t want to be out a lot of money to attend, but did go ahead and buy a new fold up traveling table which was on sale and fits nicely in the back of my car and will come in handy at upcoming events. Hopefully I can find a tote with wheels on sale, too. I’ve seen some nice ones that lock and have good sized and sturdy wheels. If not I’ll get another fold up two-wheel dolly. I will have the new table set up ready for next season. 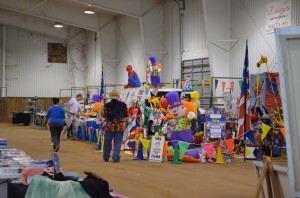 I probably won’t go as crazy as Inky the Clown‘s set up, though…wow! We ran into some fellow Star Wars fans. 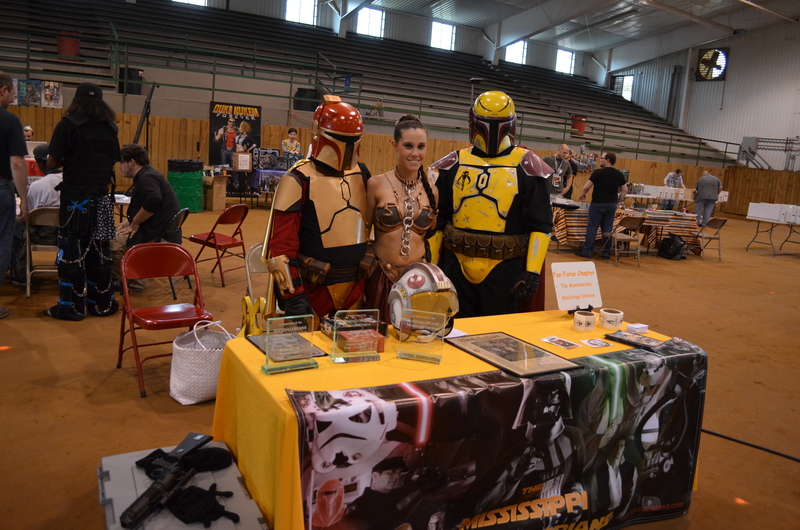 The Mississippi Mandalorians had a booth there and members in costume, and it’s not a con without a Slave Leia. We also ran into some familiar faces from the Superman Celebration in Metropolis, IL. Normally they are dressed as some amazing supers, but for this show costumers John Clark and Brin Londo were there as civilians, but had plenty of costume pieces on display. 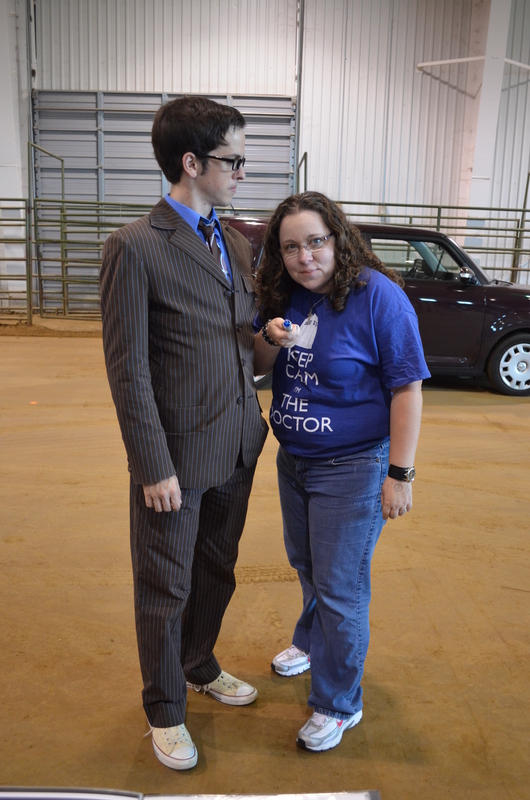 Speaking of Dr. Who, we saw a few Whos there, too! I hate we didn’t get a show of the female 4th Doctor who looked great in the Tom Baker hat and scarf. 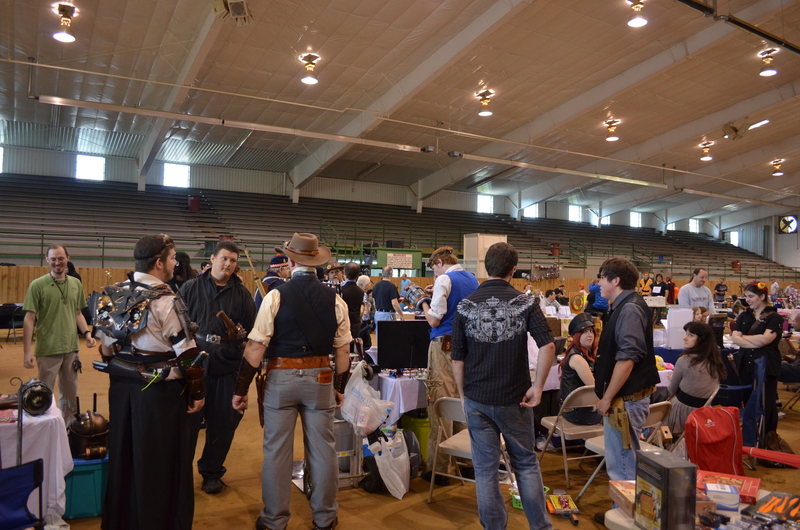 Time travel and steampunk costuming was very popular at this show- and there were a couple steampunk booths, too. 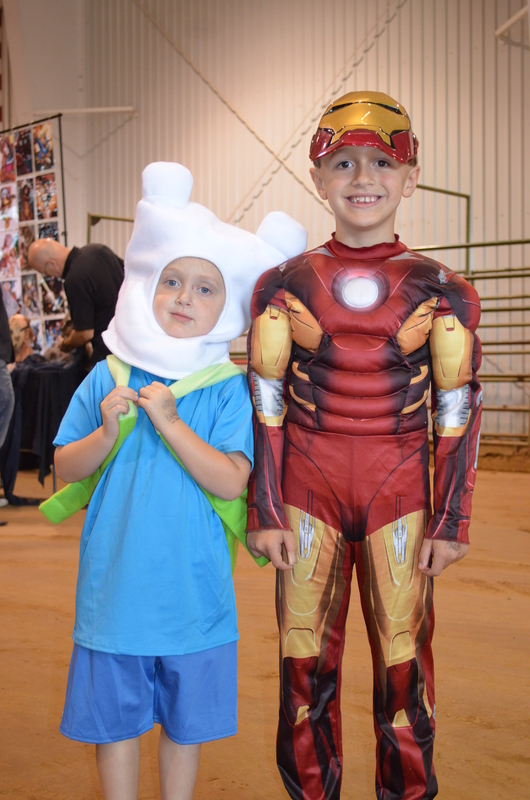 There were also several kids in costume at the show which is always great to see. 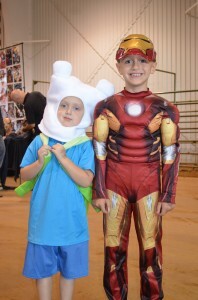 I wish I could have dressed up and gone to comic conventions as a kid! 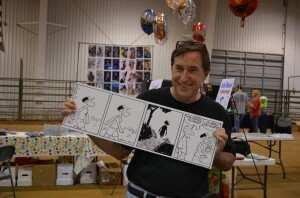 But you can’t have a comics convention (or festival) without comics! “Arlo & Janis” cartoonist Jimmy Johnson was the main guest there. 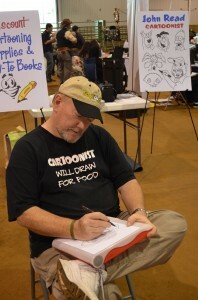 Cartoonist and SEC/NCS member John Read was drawing toons and selling art supplies and books. I picked up some Copic markers from him- and at a great price! Be sure to check out his magazine Stay Tooned! 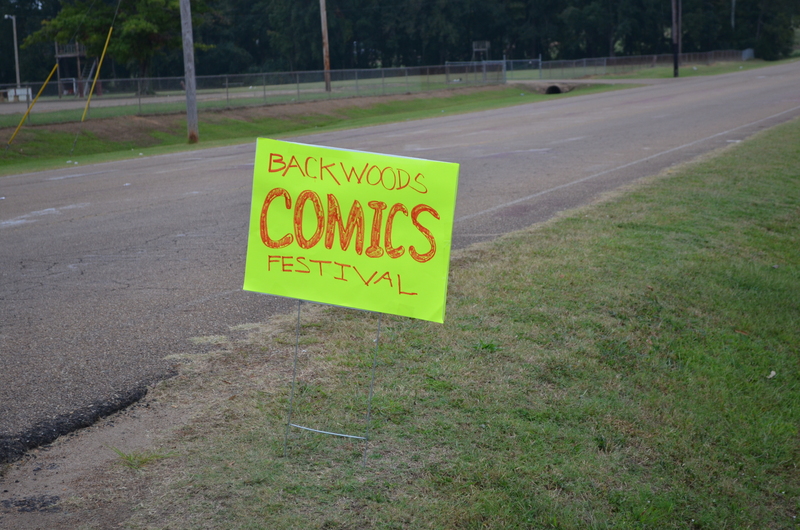 Big thanks to Bubba World Comix creator and show organizer Andy B. Childress for the invite to the Backwoods Comics Festival. Had a blast talking to him, fellow sketchcard artist Chuck Jett, and the other artists there!